In all corners of civilised society, there is an unstoppable force that changes perspectives, habits and interests – the trend. Whether it’s fashion, music or food, today’s pleasure is tomorrow’s poison. Kangol hats were the height of fashion in the 90s but now only appear on Samuel L Jackson; the identity parade on TV’s ‘Never Mind The Buzzcocks’ shows that teen pop stars that currently dominate the radiowaves will be unrecognisable to the generation that succeeds them (those unfortunate little blighters have never experienced the beauty of rap music from Ant and Dec); and I don’t know about you but if I see another burger restaurant where you have to queue to get in, I’m taking up cow-tipping. Once they lose their youth, things that were once deemed cool eventually lose their allure. Luckily, there are exceptions – things that stand the test of time and seem impervious to the trends that rise and fall around them. Namely – aviator sunglasses, Jimi Hendrix and Chinese food. Appearing next to cornershops and newsagents, you can find them on the most glamorous streets of Mayfair (Berkeley Street) to the dingiest alley in Zone 12. They bring food to your house or you can take the whole family to an undoubtedly nearby example for a great night out. Yes, Chinese food is everywhere and always has been. There is even the eponymous China Town area of London where you can fully immerse yourself in the cuisine and culture (there are not many other countries that can boast such a widely accepted claim on London’s geography). Chinese food, I salute you. So when I was summoned to visit one of my (and the world’s) favourite cuisines, for my favourite meal of any (Sunday lunch), at one of London’s most famous examples of Chinese food (Hakkasan) I was expecting quite a show. 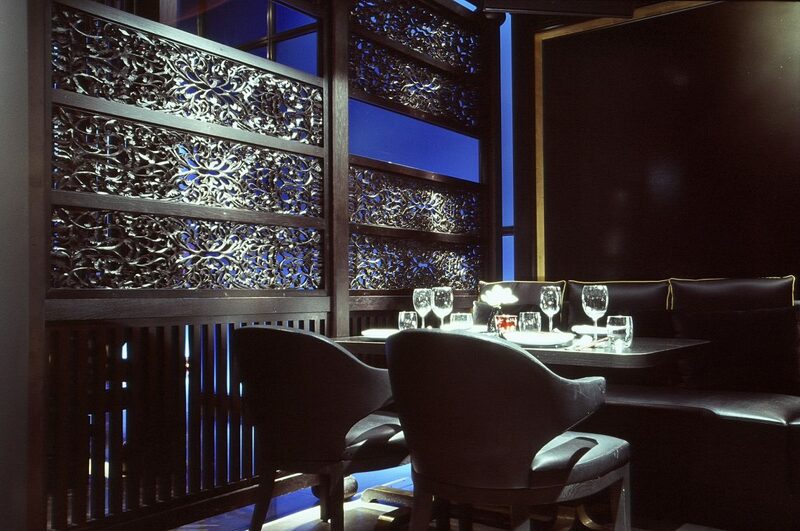 Hakkasan’s Dim Sum Sundays treat each diner to a six course meal consisting of: a salad to start, four steamed dumplings, four fried, baked or grilled dumplings, a small main, a main course and dessert. This all comes at mesmerisingly reasonable price per person with half a bottle of Perrier Jouet Rose Champagne (one bottle to share between two) and two cocktails each. The same meal is available without the tipple, including instead non-acoholic cocktails and premium teas (as if!). It goes without saying that every single dish was incredible. From the salad, to the last sip of champagne – every encounter with the cuisine was a beautifully presented and exceptionally flavourful experience. So much so that inter-dish comparison is between the excellent to the exceptional; therefore describing each dish would take an age. Instead, I’ve picked out the best of the bunch (try not to dribble too much). 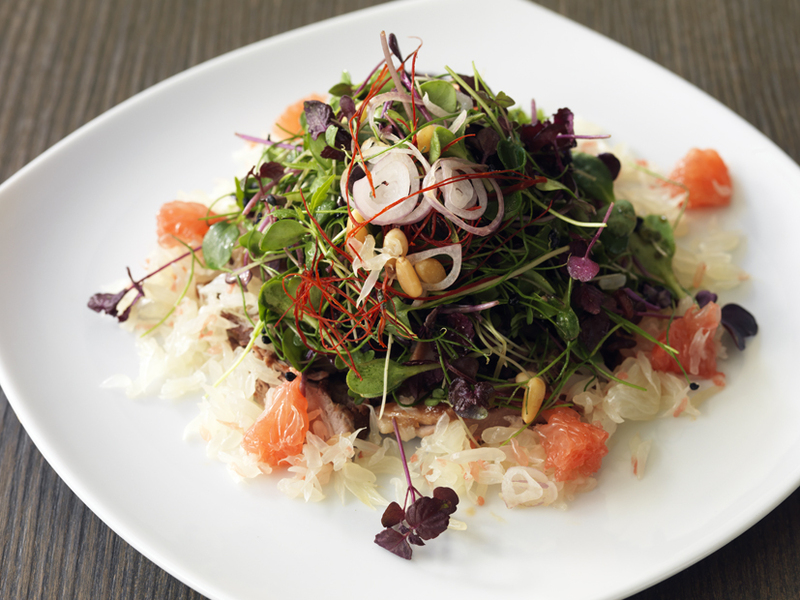 Salad – Crispy duck salad with pomelo, pine nut and shallot, just the way I like my salad… meaty! 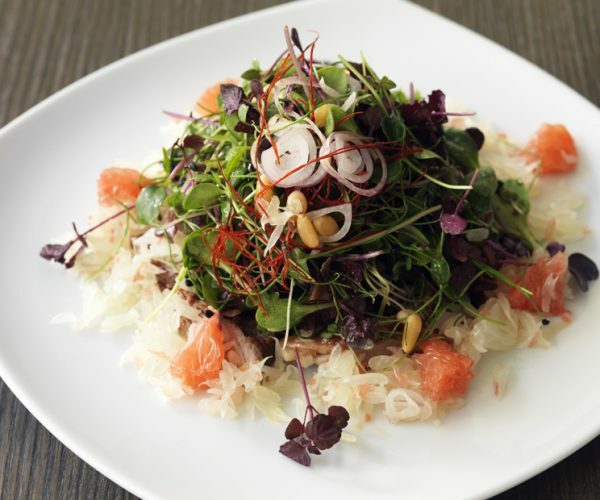 This dish was a clear example of a salad that had been individually prepared, in stark comparison to the thrown together piles of leaves that are found in lesser eateries. A flavourful matrimony of succulent poultry and fresh ingredients – a great start. Steamed Dumplings – XO scallop dumpling with Thai asparagus and lingzhi mushroom. Scallops rarely disappoint and the steaming process transforms a great ingredient into a juicy and delicate dumpling. Fried, baked or grilled dumpling – the fried golden lobster roll. The delicacy and complexity of this was such that care and precision that had gone into each piece was evident in every bite. The crust was crispy and perfectly cooked but took nothing away from the natural flavour of the lobster within. Main – stir-fry rib-eye with Merlot, each piece perfectly charred with a medium rare centre, complete with a deliciously tangy sweet-and-sour(ish) glaze. 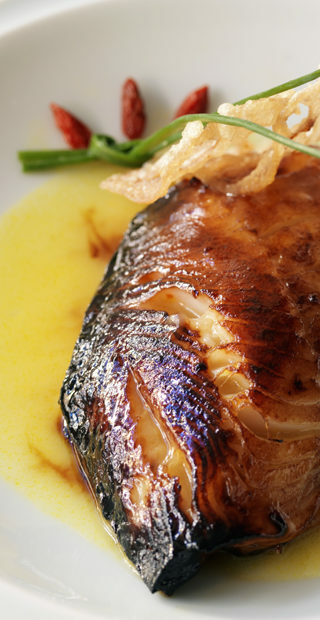 This was presented in a beautiful sail-like structure and was by far the stand-out dish of the entire meal. The cocktails were Fleur De Coco – coconut water, raspberry, Belvedere vodka, Akashi-Tai sake, and Gaelic Caesar – Ardbeg 10‍yrs whisky, Worcestershire, clamato juice and lemon. 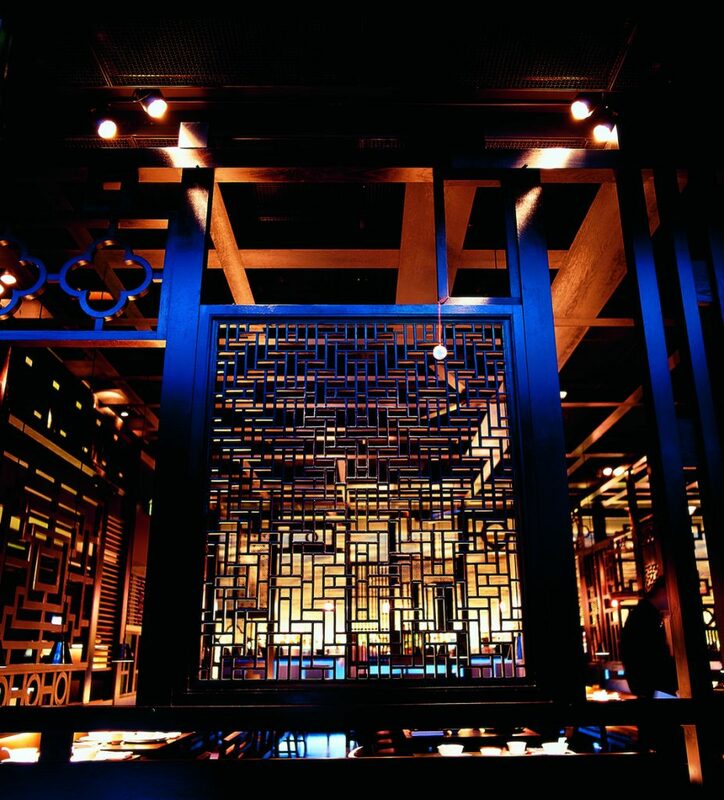 Hakkasan Hanway Place almost reinvents the idea of tucked away restaurants (you would have to rely on instinct as opposed to Google maps to find it), and has one of the most unassuming exteriors you are likely to encounter. But this just adds to the charm and, combined with the underground setting and simmering lighting, creates an atmosphere that defines comfort and intimacy. 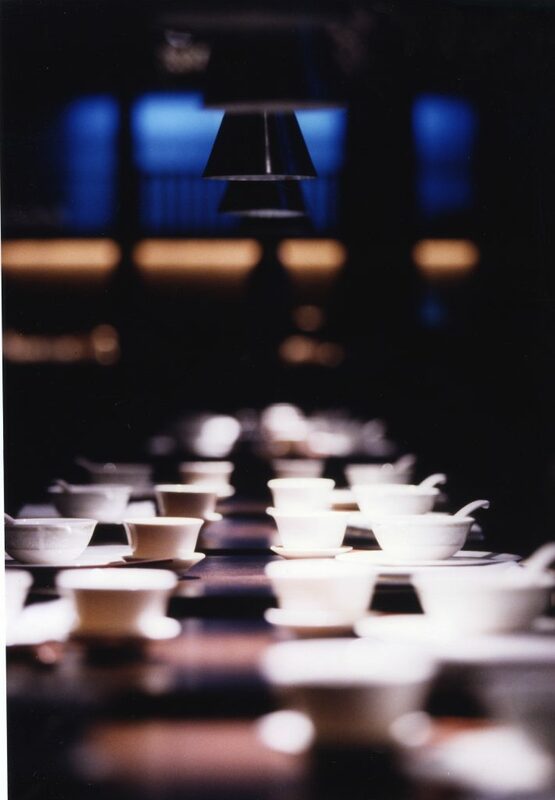 It is clear that every atom of Hakkasan’s composition has been carefully planned and executed. This is evident in everything from the friendly and knowledgable staff to the lighting and décor and ends with the food – all of this is experienced before placing an order. 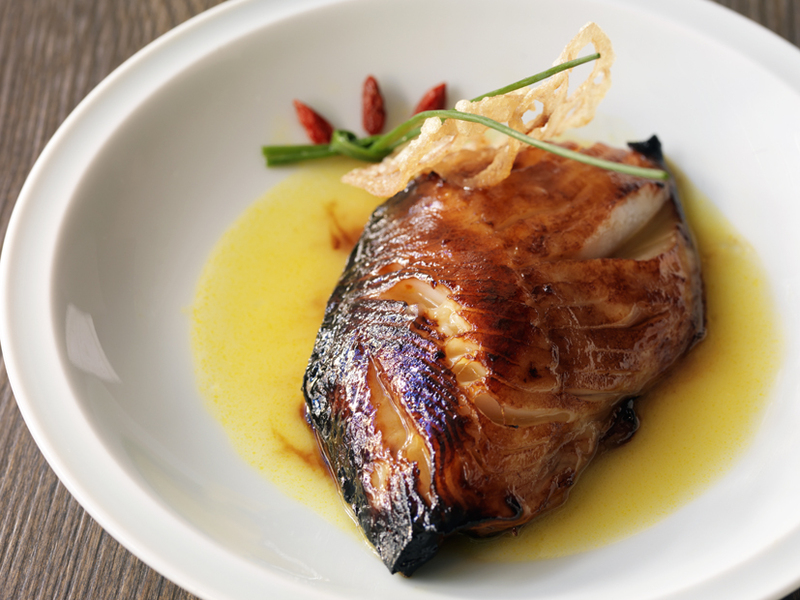 Once the food arrives, it is clear to see why this particular cuisine is a feature of London that has immortal characteristics and is delivered in such a way that makes Hakkasan’s fame entirely justified.